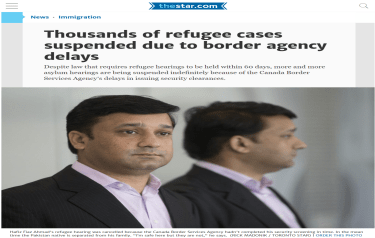 Immigration law — Refugee protection — Persons in need of protection — Humanitarian and compassionate considerations — Widow, Sri Lankan citizen with no living relatives in Sri Lanka, living and supported by children in Canada, should not have been denied refugee claim on humanitarian and compassionate grounds — Officer unreasonably concluded widow not dependant on family in Canada, where she clearly was. Bernard Assan, for the Respondent. The Applicant is a 64-year-old Sri Lankan widow whose only remaining children live in Canada. She was denied her H&C application and this is the judicial review of that decision. The Applicant is a citizen of Sri Lanka whose refugee claim was denied in 2004. She and her late husband then applied for H&C consideration. Regrettably, Mr. Tharmalingam Sr. died before the H&C process was completed. The Applicant has three children in Canada; another son has disappeared in Sri Lanka and his whereabouts are unknown. The suggestion is that this son was caught up in the civil war and has just disappeared. Mrs. Tharmalingam had been receiving welfare assistance until a year ago. After that, she has been supported by her children, despite the fact that one is unemployed, another is collecting employment insurance and the third is paid $1,200 a month. In dismissing the application, the Officer concluded that the Applicant had not shown a sufficient level of dependency on her family to justify an H&C decision in her favour. The Officer noted the financial situation of each child, as described above, and that separation from her family was no more difficult than it would be for other families in a similar situation. Lastly, on this financial point, the Officer noted that the Applicant’s children could sponsor her family class application from overseas at a later date. In discounting the Applicant’s claim that she was unable to return to her home country because no one is left there and her home is destroyed, the Officer concluded that the Applicant had not sufficiently (a) explained why her missing son could not be located and (b) shown that her home was destroyed. The Officer, in reviewing the Applicant’s evidence of establishment, noted that she had shown little establishment since her arrival. Lastly, the Officer concluded that the Applicant, who is no longer on welfare and her children are taking care of her, had not sufficiently shown how she was supporting herself. As Dunsmuir v. New Brunswick,  S.C.J. No. 9, 2008 SCC 9, has established, where the matter is of mixed law and fact or fact generally, the standard of review is reasonableness. The reasonableness standard requires the Court to engage in a somewhat probing examination of the reasons for a decision while also recognizing that where discretion is being exercised and where the decision maker has some level of expertise or familiarity, a measure of deference is owed. In my view, there are some significant difficulties with the decision. Sympathy for the Applicant’s circumstances is not the governing or even influencing factor. H&C decisions are often difficult and frequently involve tragic circumstances. It is also important to observe that “humanitarian and compassionate” is a technical term not necessarily imputing the meaning more commonly given to the words. In my view, the Officer reached an unreasonable conclusion on the financial evidence. The fact that the Applicant’s children could not meet the financial requirements for a sponsorship application cannot be a relevant consideration, particularly in the face of evidence that the children have been able to take care of the Applicant despite their difficult situations. The further finding that the Applicant had not provided sufficient evidence to show how she is supporting herself flies in the face of the evidence to which the Officer referred in the same paragraph. That evidence, which is uncontradicted, is that the Applicant lives with her children and that they look after her, particularly now that she is without social assistance. This evidence goes to the root of the first finding by the Officer that the Applicant had not shown a sufficient level of dependency on her family in Canada. Where one is dependent on family for the roof over one’s head and the food on the table, it is difficult to see how that evidence, particularly in these circumstances, did not weigh heavily on her dependency on her family. The Officer’s comments concerning an overseas sponsorship application can be taken as illogical in the current context where the sons do not meet the financial conditions for sponsorship. It could also be taken as speculation about the future. In either case, it does not assist in the analysis of the H&C application. While the burden is on the Applicant to establish her case, it is difficult to see what more the Applicant could do to explain her missing son’s whereabouts. If the Officer did not believe her about this matter or that of losing her house, a matter which may be open to the Officer, it is not possible to discern the basis for the conclusion. While there are problems with this decision, it is not fair to say that the Officer was capricious. Hard facts make for hard decisions and the Officer had to balance human sympathy with the law. Given the Court’s conclusions, this judicial review will be granted, the decision quashed and the H&C application referred to a different officer to be decided on a new and more current record. THIS COURT ORDERS AND ADJUDGES that this application for judicial review is granted, the decision is quashed and the H&C application is to be referred to a different officer to be decided on a new and more current record.